Last year, City Colleges of Chicago partnered with Apple to offer coding “bootcamps”—crash courses in computer programming designed to get students up to speed and connect them with jobs in the software industry. The pilot program, which was free and ran from April to September, was to test how a bootcamp-like course would work in a community college context and to set up course graduates with jobs and internships. Students who participated said they enjoyed and learned from the pilot, which has the potential to be a great resource. But as the second bootcamp begins this month, the program’s limited selection of applicants and poor job placement—one of the metrics of its success—raises questions about its future at City Colleges. The course was designed to mimic the structure of coding bootcamps, which have become popular in recent years for people looking to transition careers into software development. Out of over three hundred applicants, only thirty-five were accepted, with twenty-one at Truman College in Uptown and fourteen at Kennedy-King College in Englewood. Application was open to everyone—not just current City Colleges students—and the course ran nights and weekends for four and a half months. Students finished the program with a final coding project and were promised programming internships at Chicago-based companies. Unlike traditional bootcamps, whose thousand-dollar registration costs are prohibitively expensive, the City Colleges program was free; laptops were provided, and students just had to pay for their own transportation to class. Students learned how to code with Swift, a programming language introduced by Apple in 2014 for creating games and apps for iPhones and other iOS devices. City Colleges created the course in close collaboration with Apple, which designed the curriculum, trained instructors, and donated laptops for class. Apple worked with city educational leaders to bring its curriculum to Chicago’s public schools and community colleges throughout 2018 as part of its Everyone Can Code initiative, which was a push by the company to have its Swift curriculum adopted in classrooms across the country—part of an arms race among big tech companies to make their products educational necessities, from the preschool to higher education levels. Freeman attended a two-day teacher training program at Apple’s headquarters the summer before and helped other instructors get acquainted with the curriculum. He said that the curriculum moved past simply learning to code—it emphasized learning to “take an idea from concept to design to development” so that students could create apps on their own in the future. During a Tuesday evening class in July at Kennedy-King, instructor Falechia Turman pulled up a seat to help a student struggling through an assignment in the computer lab. Nearby, four students were working on sleek silver MacBook laptops. One, William Twum, demonstrated a hangman-like game app he had made, with red apples disappearing from a tree each time the player guessed an incorrect letter. Twum seemed totally at ease with the technical material. He had studied mechanical engineering at the University of Illinois at Chicago and at the time of the bootcamp worked as a product designer using computer-aided design software at a furniture manufacturing company in Chicago. 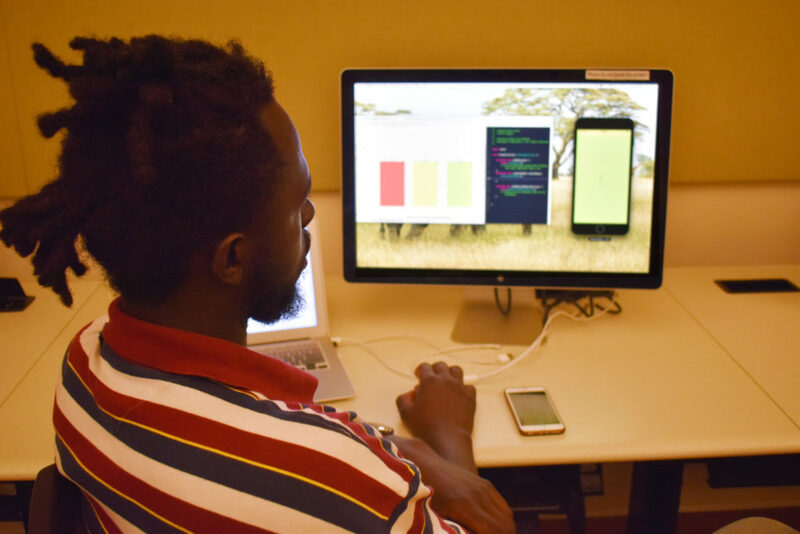 One of Twum’s classmates, Larman Smith from the northern suburb of Lincolnshire, had done coding bootcamps before and had worked as a contractor developing a website for a year. Smith had applied to this program to get exposed to another programming language and to build out his résumé in the hopes of getting a full-time job or internship. Another classmate, Cathrine Goss, had a technical background as well. Goss had done software quality assurance testing since graduating college in 1996 with a computer science degree, but she had never gotten the hang of programming and debugging applications. She had been looking to take a programming class with an eye toward transitioning to a programming position at work, and after learning that the Swift bootcamp was free, she decided it was too good to pass up. Turman, their instructor, thought the bootcamp was going very well. “We have a few [students] that are very advanced, they’re taking the programming language and they’re running with it,” she said. “And then we have some that is more challenging for them and that’s when we have to give them extra attention because they have not had experience.” Turman joined City Colleges as an adjunct math faculty member in 2009, but has a business background in computer science that made teaching the bootcamp a natural fit. After some initial training from Apple, she began teaching the class of fourteen students at Kennedy-King. In addition to teaching students how to code, one of the bootcamp’s main goals was to lead its graduates straight into careers as software developers. Students received an hour of job skills training each Saturday morning in addition to lectures and labs on programming concepts. This combination of technical training interspersed with career counseling is common among more expensive traditional programming bootcamps, where students are also often navigating career transitions into the software industry. The Swift program is something of a homecoming for bootcamps. In 2011, Code Academy (later known as the Starter League), the first programming bootcamp in the nation, was started by Northwestern University graduates Michael McGee and Neal Sáles-Griffin (a Kenwood native now running a long-shot mayoral campaign). It began as a twelve-week course in Ruby on Rails (the popular programming framework that Twitter is based on) with thirty-five students and a $6,000 price tag. Within a year of Code Academy’s launch, similar bootcamps sprang up across the country, fueled by people who wanted to transition to a career in programming but didn’t want to spend the time on another college degree. Today in Chicago there are over a dozen coding bootcamps, and ninety-five in the U.S. It’s a $266 million a year industry, with nearly 23,000 graduates in 2017 alone; demand is driven by the projected rise in high-skilled programming jobs in the country. For some, bootcamps seem like a good deal. In exchange for a hefty price, they provide a training in programming usually only attainable with years of education. Job outlook on completion of a bootcamp is good. Across all coding bootcamps, an estimated two-thirds of students get a programming job within ninety days of graduation. A look through websites that review bootcamps shows students praising the training they’ve received from bootcamps like Fullstack Academy or General Assembly. Additionally, many colleges and universities, include the City University of New York and the University of Minnesota, are beginning to offer bootcamps of their own. But there are issues with the model. There is little transparency over data about student success rates, one of the metrics bootcamps use to advertise and justify their high costs. In 2016, the bootcamp Coding House was forced by California regulators to shut down for falsely advertising student employment and salary information upon graduation. In response to concern over the unregulated nature of the rapidly expanding industry, two main groups have emerged as the leaders in quality assurance for coding bootcamps: Council on Integrity in Results Reporting and Quality Assurance Task Force. But neither organization has been able to persuade the majority of bootcamps to turn over data measuring student success rates. There are also obvious financial barriers. The average program today costs $11,400 for a fourteen-week course. Unlike most colleges and universities, bootcamps are run by for-profit institutions and do not offer financial aid to students. Some programs, like the Grace Hopper track at Fullstack Academy, experiment with a delayed model of payment, collecting tuition from students only after they secure a full-time programming job. This type of arrangement helps students afford tuition, but repayment can still be burdensome on students and programs offering a delayed payment structure are limited, requiring some students to relocate to another state. There are also tuition-free programs, but those are also highly selective and some, like Ada Developers Academy, are only available to women, who are underrepresented in the technology sector. Bootcamps also have rigorous admission standards that act as another barrier. Many programs require students to pass an entrance exam to demonstrate a basic understanding of programming fundamentals. Some have a lower acceptance rate than at the most prestigious universities. If the Swift bootcamp pilot takes off, City Colleges could create a program as effective as for-profit programming bootcamps, but more widely accessible to students from a variety of financial and educational backgrounds. With bootcamps now being offered at three of its campuses across the city, City Colleges schools are easier to commute to than existing Chicago-based for-profit bootcamps, which are all clustered in downtown. The program is also currently free, removing the financial barrier that the cost of attending a for-profit bootcamp presents to potential students. The City Colleges pilot bootcamp seemed to do well by its students’ standards—Goss, Twum and others were happy with the instruction and curriculum. Though it’s difficult to compare to for-profit bootcamps, which don’t often release data about its students, the pool of students at the Swift bootcamp looked relatively diverse. At the Kennedy-King class, students’ ages ranged between twenty and sixty and lived and worked across a variety of neighborhoods in Chicago. In other respects, the program has much to improve on. Lugo said that City Colleges wanted to “rapidly upscale individuals with some tech affinity in order to position them in junior or entry level iOS coding positions across the Chicagoland market.” By that metric, the success of the bootcamp was mixed. Though internships were promised to students who finished the course, it seemed that the program had trouble lining up internships by the end of the bootcamp. Daniel Sternfield, the director of media relations at City Colleges, said that students were provided with job search services from a recruiting firm after the bootcamp was over, and City Colleges hired three students from the initial cohort to work as instructors for future iterations of the program. By press time, the Weekly was waiting for updated numbers from City Colleges. In addition to lackluster career advancement for students, the small, tech-savvy cohort mirrored the high admission standards of for-profit bootcamps. Many students in Turman’s class at Kennedy-King already had significant programming experience, including jobs and degrees in computer science. According to Lugo, prerequisites for the classes included “basic principles in coding, basic principles in development, as well as an affinity for technology products.” Though it’s important for students wishing to take part in an accelerated training program to have a basic degree of comfort with computers, these criteria narrow the window of who’s likely to be accepted and make the program less accessible. Even with the strict requirements, the workload could be heavy and some students, like Goss, fell behind. Out of the initial fourteen students at Kennedy-King, ten completed the program; at Truman, seventeen completed out of a total of twenty-one initial students. Goss, a South Shore resident, had to commute twice a week to her full-time job in Lincolnshire, an hour’s drive north. She had to put in extra hours to catch up, though some of the students that eventually dropped out may not have had the kind of work-life flexibility to do so. While a bootcamp is inevitably fast-paced, having some system in place to catch students once they fall behind could improve on the program’s success. The City Colleges bootcamp program is still in its early stages, which means there’s room for growth. As the second Swift bootcamp starts on January 14, and a pilot cybersecurity bootcamp is scheduled to begin in the spring, educators have the opportunity to work on improving retention rates and open up the program to students with a wider range of technical ability. But even then, whether the program can successfully find internships and jobs for students who complete the course will be critical to determining its viability as a career advancement tool for City Colleges. Tammy Xu is a contributor to the Weekly. She last wrote for the Weekly in September about the second annual Taste of Black Chicago. I am a student in the Second cohort. I am interested in speaking with Tammy or another contributor with information about this program’s second cohort. I can provide more detailed information about the benefits/challenges of this bootcamp.